If you already know what Flitto is, but want to find your way around the platform, then this Flitto Guide is for you. Here we help you with the basics. If you have arrived at this site just by chance and do not know what Flitto is, then you could read some interesting things about an easy way to earn a few bucks online doing translations, by clicking here. In this post, we will show you how to open an account with Flitto, the different sections that compose the platform, some of the Twitter accounts included and how to register as a Professional Translator. 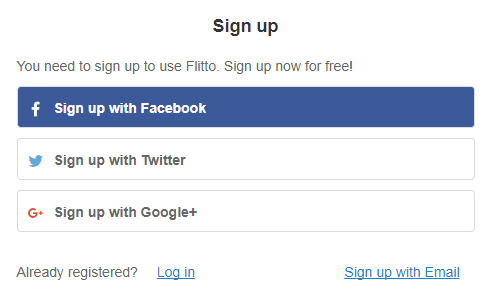 Opening an account with Flitto is easy. You simply have to go to their home page (Flitto.com) and click on the white padlock in a circle in the upper right corner. You can sign up using your e-mail, Facebook, Twitter or Google + account. Once you have signed up a confirmation message is sent to you. You must open your e-mail and click on the link. Doing this, your Flitto account will be activated. To start translating, you must choose a pair of languages. There are, at the time this post is being written, 18 languages available on Flitto. These languages are: English, Arabic, Simplified Chinese, Traditional Chinese, French, German, Indonesian, Italian, Japanese, Korean, Portuguese, Russian, Spanish, Vietnamese, Tagalog, Thai, Hindi, and Turkish. Once you have chosen at least a pair of languages, you must answer a simple test, for each pair. In this test, you are asked to do five translations and the answers are also given to you in the form of A, B, C, and D options. You must choose the correct option for each of the five paragraphs that you have been given. You must have three correct out of five to pass the test. It is very easy to get approved because the translations you must do are simple. If you have an intermediate level of the language, you’ll pass with no difficulty. Here is where other users that need translations submit their requests and a crowd of translators present, each one of them, a translation. Requests for translations may be submitted in text form, as an image, and as an audio file. Flitto also has an option called “Real-time image” where an image is submitted and an instant translation is done. This menu has three submenus: Home, Translate and Guide. To translate what other users have submitted you must go to Translate. In our experience using the platform, the longest requirements for translations we have seen on this section is about three to four paragraphs. Payment is related to the extension of the requirement. Only the translation that has been elected by the person that submitted the requirement receives payment. The translations that have not been chosen, do not receive anything. Here are submitted the requests for translations of people who want a specific Flitto translator to have the job done. This menu has three submenus: Services, Translator and Guide. To receive translation work here, you need to be registered as a Flitto Professional Translator. To do so, you must go to the sub-menu Translator on the 1.1 Pro Translation tab and follow the steps. Basically, to be approved as Professional Translator, you need to complete 2 translations of about 400 words each one. Flitto evaluates your work, and after a couple of days sends you an e-mail approving or disapproving. If you don’t pass the test, you have to wait six months to present it again. This has two submenus: Social Translation and Contents Translation. In Social Translation sub-menu are Twitter accounts related to News and Television Broadcasting Companies, Organizations, Sports, Politics, Magazines, TV Series, Movies, Games, Artists, Singers, TV presenters, Influential people, Actors, Actresses, and so on. ABC News, Al Jazeera English, BBC Breaking News, BBC News (World), BBC Science News, CBSNews, CNN, CNN Breaking News, CNN International, FoxNews , New York Times, World Science, News The Economist, The Guardian, The New York Times, The Voice of America, TIME, Wall Street Journal , Washington Post and Yahoo! News Topics. Adidas, Air Asia, Airbnb, Airbus, Amway, Android, BMW, Coca-Cola, Dior, Facebook, Google, McDonald’s, Microsoft, NASA, Nike, Pepsi, Samsung Mobile, TED Talks, UNICEF, UnitedNations and ZARA Official. BBC Learning English, Duolingo, and History In Pictures. Animal Planet, Brainy Quote, DC Comics, Disney, DreamWorks Animation, Game of Thrones, Harry Potter Film, Internet Movie Database, League Of Legends, Marvel, National Geographic, Pokemon, Pokémon GO, Pretty Little Liars, Science Channel, TechCrunch, Trip Advisor, Vogue Magazine and Warner Bros Pictures. Adam Levine, Adele, Alexander Ludwig, Ariana Grande, Avril Lavigne, Barbara Palvin, Beyoncé, Bill Gates, Britney Spears, Bruno Mars, Chris Evans, Chrissy Costanza, Coldplay, Demi Lovato, Ellen DeGeneres, Emma Watson, J.K. Rowling, Jason Mraz, Jessica Alba, Jimmy Kimmel Live, Joseph Gordon Levitt, Justin Bieber, Justin Timberlake, Katy Perry, Lady Gaga, Leonardo Dicaprio, Malala Yousafzai, Mariah Carey, Maroon 5, Miranda Kerr, One Direction, Oprah Winfrey, Paris Hilton, Paulo Coelho, Rihanna, Selena Gomez, Shakira, Taylor Swift and Tom Cruise . These Twitter accounts are only a few of the total listed on Flitto. This list doesn’t even represent 5% of all the Twitter accounts on the platform. And the other sub-menu is Contents Translation. This is an online magazine. Here, Flitto publishes content about its platform and about a great variety of other social subjects, not related to Flitto. Content here is largely based on images with one or two sentences of text on each image. Flitto requires users to translate these texts and pays for its translation. A post can normally contain between ten and thirty images with its related texts. Content here is easy to read and engaging. Because there is such a variety of content, you will indisputably find things interesting for you. There will always be posts that will catch your attention. There is a special tab in the main menu that is activated once in a while and that is the Event tab. This section is only opened temporarily. Flitto will notify you when an Event has been opened involving the pair of languages you have specified. And you will also notice the tab available in the main menu. There are two classes of events: in one, you will be asked to translate individual sentences, and on the other, you will be required to record your voice reading individual sentences. Events pay ten times better than translations in discovery so keep an eye open for them. We hope you have found this basic guide about Flitto useful. If you have any comments or questions feel free to share them in the box below.